A gift from the artist to the present owner. London, Institute of Contemporary Arts, The Independent Group: Postwar Britain and the Aesthetics of Plenty, February-April 1990, no. 9; this exhibition travelled to Valencia, Instituto Valenciano de Arte Moderno, Centro Julio Gonzalez, May-September 1990; Los Angeles, Museum of Contemporary Art, The Independent Group, November 1990-January 1991, Berkeley, University College Art Museum, February-April 1991; Dartmouth, Hood Museum of Art, June-August 1991; and Buffalo, Albright-Knox Art Gallery, September-November 1991. London, Tate Gallery, Richard Hamilton, June-September 1992, no. 9, illustrated in colour; this exhibition travelled to Dublin, Irish Museum of Modern Art, October 1992-January 1993. Four pictures entitled 'Trainsition' of which 'I' was a preliminary version of 'IIII' and 'II' a trial run for 'III', carry the exploration of schematic treatments of simultaneous movement of spectators and subject into a new area of representation. The study of motion perspective seen in such paintings as 'd'Orientation' emerged from purely conceptual notions into the world of direct visual experience. The paintings were made at the time of Hamilton's frequent travelling by rail between London and Newcastle-upon-Tyne, where he was teaching. The title is a pun on 'Train sit I on', as the typography of the numbering is a pun on the structure of railway lines, which rest on sleepers. In 'Trainsition III' the observer gazes in the direction of travel. 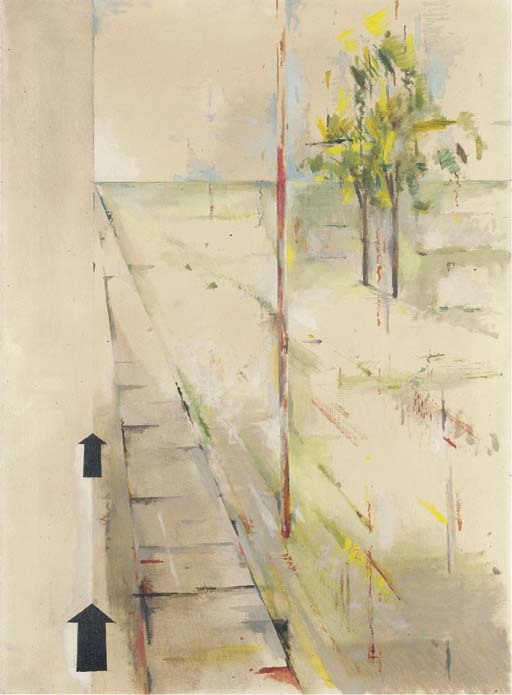 'Trainsition IIII' (Tate Gallery, London) again from 1954, adopts the viewpoint of an observer looking out of a train at 90 degrees to the direction of travel (see J. Darby and R. Morphet, Richard Hamilton, Tate Gallery exhibition catalogue, London, 1992, p. 146).